Efforts to conserve the biological diversity and carbon stocks of species-rich rain forests should address diseases that affect local forest stewards. The problem: In wider Amazonia, malaria has a disproportionate impact on fragile native peoples. Small populations, remote from medical care and living with meager surpluses of food and fungible resources, are hit hardest by illness. Malaria is a relatively new disease in the New World and it can be considered a primary threat to cultures native to rain forests. Thus, the disease is also a direct threat to stewardship of those forests occupied by indigenous people. Yet there is no comprehensive plan to control malaria among remote rain forest groups. The solutions: (1) Quick detection. Rigorous training of indigenous medical field technicians is critical to controlling malaria. Microscopy is still the gold standard for malaria diagnosis. Accurately assessing the presence of parasites in blood smears under a microscope—and correctly identifying those parasites to species—is a skill that requires months to master. (2) Appropriate treatment of the disease, including follow-up testing. Plasmodium falciparum resistance to chloroquine treatment has developed throughout wider Amazonia in large part because of misuse of the drug, in particular through partial treatments. (3) Prevention. Insecticide-treated bed nets are in broad use in Africa; the equivalent (hammock nets) has not happened in remote South American rain forests. 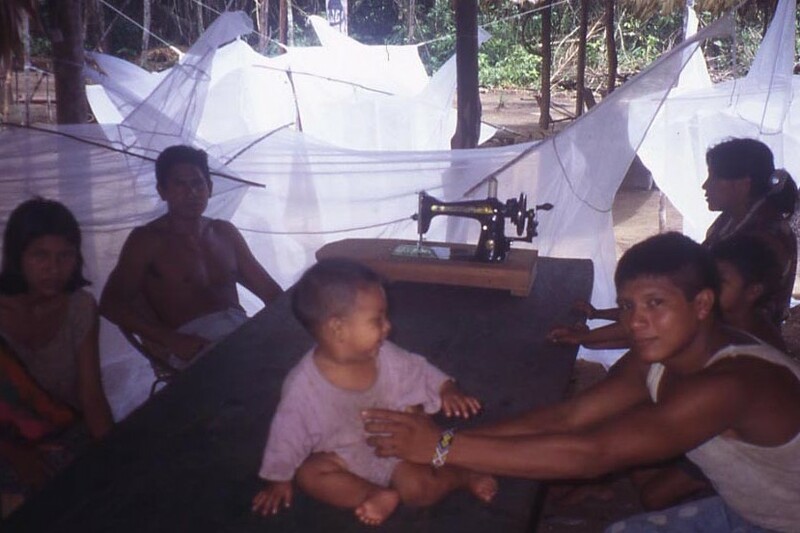 Our collaborator, Dr. Magda Magris of the CAICET (Centro Amazónico para el Control y Investigación de Enfermedades Tropicales), showed in 1997 that treated hammock nets reduced malaria morbidity in the Yanomami communities of the upper Orinoco River Basin by 50%. Yet no comprehensive program to apply these findings has been developed. Malaria, a disease caused by infection with protozoan parasites of the genus Plasmodium (delivered by mosquito bite), is endemic in the Caura River Basin. Mortality rates are unknown, as many inhabitants of the Caura show a high degree of resistance to malaria. Dozens of people may die of the disease in an endemic year. Malaria caused by P. falciparum, one of two parasite species in the Caura Basin, is invariably fatal if left untreated. The less serious strain, P. vivax, is debilitating over periods of months, and in the Caura, average annual morbidity caused by the two strains is greater than 30%. This causes enormous disruption in community activities, whether strictly economic or cultural. Furthermore, inefficient attempts to transport patients, secure treatment, and purchase medicines help drive an unsustainable bush meat trade, and involvement in gold mining (where new strains of malaria are introduced by miners from outside, greatly worsening the problem). The small government-run malaria lab in Maripa (the main Caura River port town) is grossly underfunded, staffed with poorly-trained technicians, often without adequate medicines, keeps short weekday-only hours, and does not mobilize to visit sick patients. A similar government-run service that makes occasional trips up the Caura River also suffers from poor quality training and a lack of equipment, carrying no microscopes, for example. We have sponsored the three-month rigorous training of one technician, a 22-year-old Ye’kwana man, Mu’qui Rodríguez, whose diagnostic work was then double-checked by experts for one year. Mu’qui operates a skeleton lab in Maripa, close to the Orinoco River. He also travels upriver with his microscope, visits sick patients to take blood samples, and treats patients with appropriate medications provided by the government malaria lab in Puerto Ayacucho, an eight-hour bus trip from Maripa. Over the last 2.5 years, providing Mu’qui with a stipend during his training, buying him a microscope, then giving him a full-time salary for his work has cost less than $5,000. In that time, he has treated dozens of patients. We have just completed a small lab building in traditional Ye’kwana style at our base of operations outside of Maripa to further facilitate his work. We are now ready to begin the distribution of treated nets and have associated ourselves with The Cacique Isaias Rodríguez Anti-Malaria Project that has established hammock net design, manufacture, and insecticide treatment. 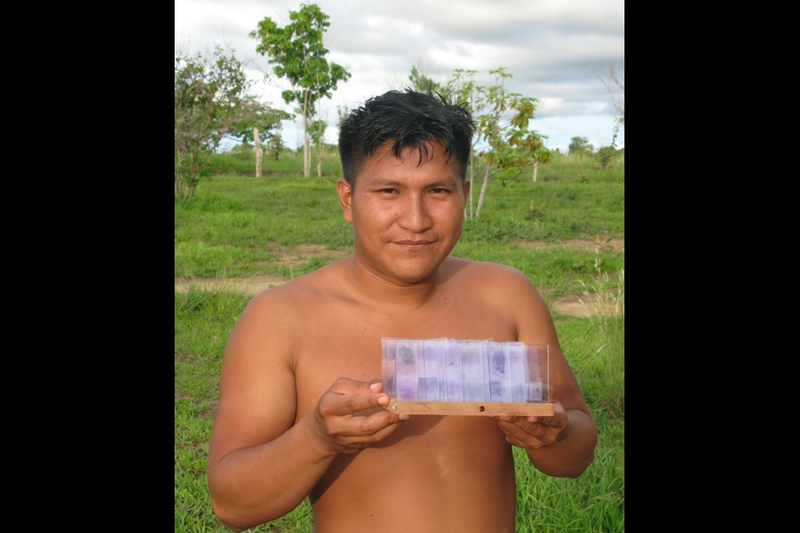 Mu’qui Rodríguez has begun collecting data on malaria mortality and morbidity from Caura Basin communities which will mark a pioneering effort to build a malaria database run by the Ye’kwana and Sanema people themselves. This will also give us baseline data for measuring effectiveness of nets in preventing malaria in the Caura. 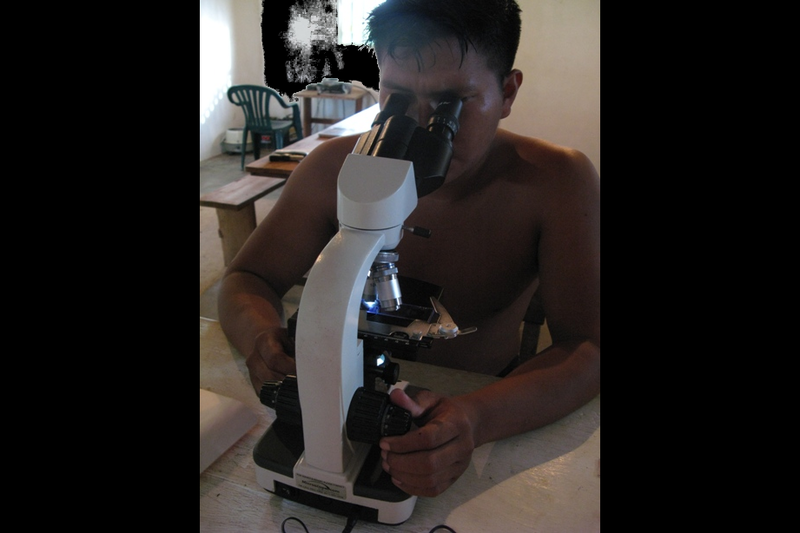 We urgently need to train additional microscopists, which we will do at the CAICET, (Amazonian Center for Control and Research on Tropical Diseases) in Puerto Ayacucho starting with one new trainee in May 2011. In the future, we seek to train Sanema technicians for more effective bridging of cultural gaps. Until now, we have relied on Sanema interpreters, or Sanema who themselves understand some Spanish.